Truly spectacular, this luxurious Calabogie area lake house (1.5hrs west of Ottawa) is perfect for large family get-aways. 4500ft2, 3 levels, 6+1 bedrooms, large great room, kitchen and dining area for entertaining. Lots of outdoor space with gazebo, upper and lower decks, as well as large dock at waterside. Situated on 11 acres with 330’ water frontage (and distant neighbours) provide a private and relaxing oasis. 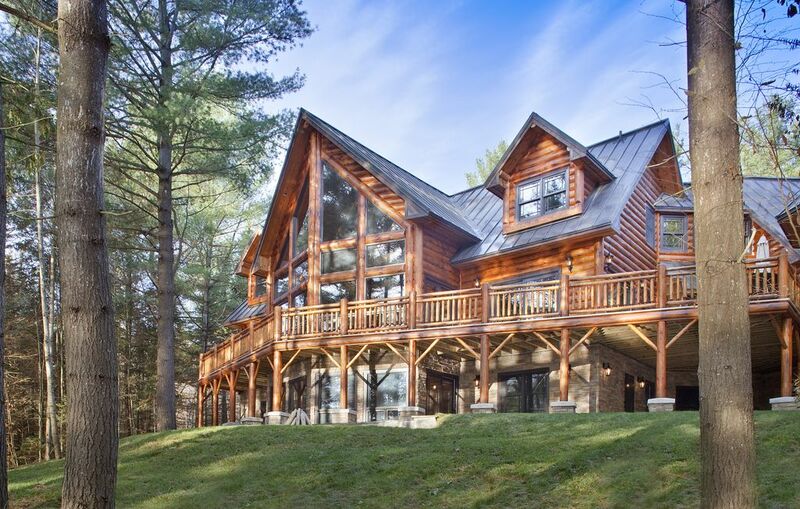 The cottage was featured in Log Home Living Magazine and a children's Christmas movie was filmed in the house. Expert craftsmanship to include natural flagstone floors, hardwood and terracotta flooring, large cathedral ceilings and stone fireplaces in upper and lower great rooms. In summer time enjoy the lake with swimming, boating, fishing, as well as hiking, and nearby golfing, ATV and auto racetrack activities. Very calm 8km long lake is clean and private. Also offers great bass and northern pike fishing. End of day can be enjoyed viewing the 110” screen in the theatre room, sitting by the outdoor fire pit, or the 2 interior fireplaces. We too have kids and know yours will enjoy the tree fort, trampoline, toy boxes, board games, rock diving, and waterfall at end of the lake. In wintertime enjoy the frozen lake for skating and ice-fishing. Calabogie Peaks ski hill is located 20 minutes away, as well as a large network of snowmobile trails. Lots of cozy corners and sitting areas in the cottage to sneak away, read a book, do a puzzle, and nap. Kitchen includes professional gas stove and oven, 2 sinks, large kitchen island, granite counter tops, beverage fridge, large Miele fridge and stand-alone Meile freezer. Jura espresso/late coffee maker, BBQ, dishwasher and washer/dryer avail for your use. Basic condiments and spices provided. As an additional service, full stocking of food and supplies can be provided. Use of rowboat, paddle boat and 4 kayaks are included in rental. Optional 22.5’ pontoon boat seating 12 with 115 hp motor is avail for rent to qualified boaters, incl ski tube, wakde board, water skis and knee board. All cottage bedding, towels and bathroom sundries are provided. Lake is surrounded by only a few quiet neighbours and 1000s of acres of crown land wilderness, you will feel like you have found a true Canadian North escape. This is our 2nd home. Busy lives with teenage kids so cottage property is often available and hence we've decided to rent. We are looking for families and individuals who will respect our property as their own. We do not rent for weddings, events, or parties. Large indoor and outdoor spaces for larger groups. Tasteful decoration and well maintained finishes. Lots of privacy. Cannot see neighbours. Approx 20 cottages on entire lake. Cottage has private lakefront. Approx 330' frontage. Natural shoreline. On Norcan lake. Large 8km long lake. Very quiet. Telephones avail for incoming or outgoing calls. Free ontario long distance. Radiant in floor heating on all stone floors. Central HVAC for remainder of house. Used for storage. Not for use. Bath and beach towels provided. Approx 25 total. Great room just off kitchen includes large fireplace and seating for 10-12. With pull up chairs, we seat 18 in the kitchen/dining area. 12 at table. 4 at island stools and pull up stools. Kids toys, dart board in theatre room. Lots of area to play. Dozens of board games. Outdoor games. Over 300 movies. Lots of childrens choices. Wii and PS3 along with games for all ages. 1 four person rowboat and 4 kayaks included with rental. Also included is large blow up floating island for kids to play on. Water slide and floating dock in bay in front of cottage. Calabogie ski hill. Minimal line-ups! 25min away. Great place for a large group, family friendly and super clean! Thanks Greg for the warm hospitality. We had a lot of fun at your beautiful cottage!